SomeGuy Battle Ox, Neo the Magic Swordsman's twin brother. For the most part. The only difference between the too is that Neo the Magic Swordsman works a _little_ better because of his trait. 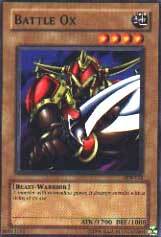 Battle Ox still works great along side of Neo the Magic Swordsman and the other hard attackers. If you want more tips, go check out the CotD for Neo the Magic Swordsman, overall there really isn't much difference between the two (And I'm not a big fan of attack enhancer cards, except for a select few). Rating: 4/5 – 1700 ATK is second best right now… YaY!